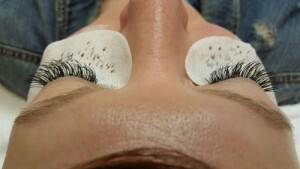 with Celebrity eyelash extensions. Single eyelashes are meticulously attached to your own lashes with special bonding glue, producing beautiful results that typically last 3-4 weeks if you maintain your new lashes properly. We have different size lashes and colors to choose from to purposefully look natural or outrageously glamorous. The majority of our clients are professional executives that appreciate a polished appearance. Our private clients enjoy a customized approach to their eye shape, their lashes the right size to enhance their eyes without being “over done”. Your new lashes can be trimmed to the perfect length. Our certified eyelash extensionist can customize shorter to longer lengths if you prefer instead of even the entire length of your eyelid. Feel free to find out what your options are with your eye shape. Mascara because your new lashes give you fullness and length.We love mascara, however; we certainly recommend a healthy lighter weighted mascara if you feel you must have it. For best results avoid products that have an oil base (like mascara) or a moisturizing characteristic as they will cause the bond to break down. Most makeup removers are not recommended for eyelash extensions of any type. First installation for Celebrity full set eyelash extensions are $250 and refills are $75 and up, depending on how many lashes must be replaced. Allow 2-3 hours for first time visits. 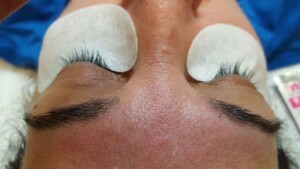 Single lash extensions fill-in service described as losing one or 2 lashes. We are happy to fill them back in. Allow 15 minutes to re-apply. Maintenance requires that you schedule every few weeks allowing 1 hour. Average costs to fill is 75.00+ depending on how many you had applied inaddition to the amount of lashes that must be replaced. Create the ultimate smoky eye with eye lash extensions or go beyond and into the fashion vanguard by using false eyelashes. Lashes really took off when the celebrity “twiggy” wore them to enhance her eyes. The added lash definition and updated ease of application make them irresistible when you’ve got a special occasion or want to look your very best. You can buy a variety of lashes or have lash extensions applied at Indulge Salon in York Pa. We specialize in Bridal lashes, individual lashes, clusters of lashes, strip lashes and corner lashes. With the wealth of false eyelash choices, you can find very natural-looking extensions in varied thicknesses and short, medium and long lengths. 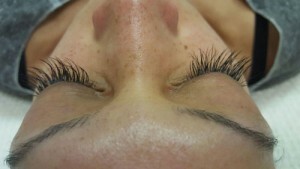 Our Celebrity eyelash extensions are flexible and natural looking. We can trim your lashes if you feel they are to fake looking or just to long that they swipe your brows. When the mascara hits the underside of your brow then that might indicate the lashes may be a bit long. For those days when mascara just isn’t enough but you don’t want to look completely made-up, treat yourself to an appointment with our aesthetician, who can give you exactly the look you want. This will, of course, be higher value and quality than the false lashes you buy a leading box store or grocery store. This type is best for Bridal lashes to accessorize your entire makeup look. With the hugging and kissing all of the family and friends at your wedding celebrating your big day, this would be the time to not worry about your mascara running or not having enough lashes to enhance your eyes. If you’re lucky enough to have naturally long, thick lashes but just want to add a bit more definition, half lashes, which sit at the outer corner of the eye, may be the way to go. Half lashes or ‘clusters” work well for women who tend to tear up — the moisture can loosen glue on lashes close to the tear ducts. They are perfect for occasions like weddings, proms, retirement parties, holiday fund raisers or graduations where tears may appear. If you already have a full lash, we can add longer or more concentrated lashes at the corner of your eyes. Choose your darkest mascara along with a liquid dark liner for more drama to create the best cat eye allure! Take a look at Instagram photos, celebrities, Grammy’s, female rock stars movies, and you’ll see some wild eyes. If you want your eyes to stand out and draw all the attention, you’ve got more eyelash choices than ever. There are eyelashes formed like little feathers in dramatic rainbow colors, for extra thickness, and lashes with tiny jewels along the lash line or at the outer corners. Some falsies are extra-long and some come in varied lengths for a fringe effect. You can use black lash glue instead of clear for even more definition. 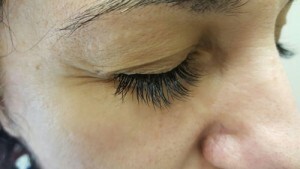 We can special order purple and extremely longer vogue lashes for you once we have a consultation. For all individual full lash extensions for the first visit, please allow 1 ½ hours to customize the installation of these lashes. Maintenance takes about 30 minutes to 1 hour every 2 – 3 weeks depending on how you care for your lashes. We do not recommend being heavy handed with mascara just a slight coating is appropriate and we do recommend lash food to give nutrients to the base of the source of the eyelash. Eyebrow extensions coming soon! Eyebrow extensions are designed to fill in the empty spots of the eyebrow. Once installed they still have to be maintained every 2 weeks. ” Love my lashes ! This was my first time getting eyelash extensions and recently just went for my second appointment to have them filled in. Priscilla was very professional, and made the experience very relaxing. She was informative on the process and care. I love that I no longer have to wear mascara or really any eye makeup for that matter. They are very comfortable, I actually forget I even have them until I get complimented on my eyelashes. Will continue to have them done at Indulge Salon!